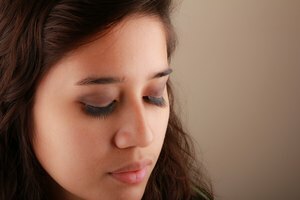 Individual fake eyelashes enhance your eyes by filling in sparse areas. Since you are not working with a full strip of false lashes, you can place individual lashes anywhere you desire more volume or length. The eyelash glue that holds the faux lashes in place adheres to the skin of your lash line and your natural lashes. 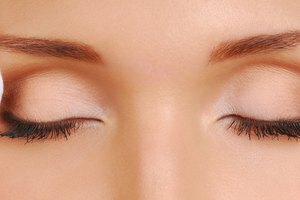 Removal of individual lashes should be done carefully though to avoid pulling out your natural eyelashes. The following steps will help you remove your lashes simply and safely. Take a shower. The steam from your shower softens the eyelash glue, making it easier to remove the eyelashes. Moisten a cotton swab with baby oil. Swipe the oiled swab over the top of your upper eyelash line. Wait 3 minutes for the oil to soften and dissolve the glue. Hold onto the tip of an individual fake eyelash with tweezers. Gently pull forward and slide the fake lash over your natural eyelashes to remove them. Start at the inside corner of your eye and work your way outward. 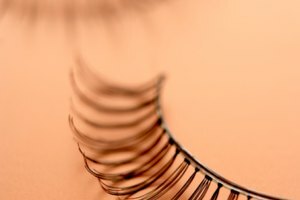 Avoid rough yanking and tugging at your fake eyelashes because you may pull out your natural eyelashes. Wet a washcloth with warm water and wipe your lashes to get rid of any glue residue. Wipe from the eyelash line to the tips of your fake lashes. Comb through them with an eyelash comb. Clean your false eyelashes so you can reuse them. Make a small bath of shampoo and warm water. Soak your eyelashes in the soapy water for up to 15 minutes. Use your tweezers to get rid of excess glue still stuck to them.